So, Saturn is in the news again, and I’d be remiss in my bloggerly duties if I didn’t mention it. Or, rather Titan is in the news again. See, it has liquid on its surface. But wait, you say, didn’t we already know that? Well, kind of. 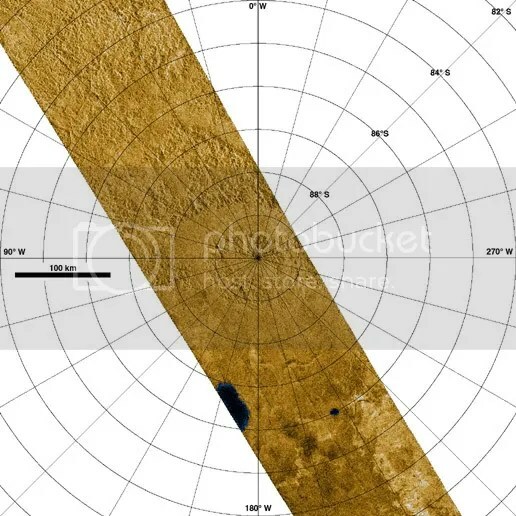 What had happened is that the radar aboard Cassini showed that there were these dark spots near the poles. Now, interpreting radar is funny, because it’s not like visible light, but, in general when something is smooth, it looks dark unless you look right where the radar is reflecting. Think about shining a light onto a piece of window glass at night — if you view it straight on, you can see the light reflecting. Otherwise, it is dark. Conversely, a rough surface looks somewhat bright at all angles. Smooth and rough here is about the same size as the radar wavelengths — centimeters or so. Re-projected false-color radar image of Titan’s South Pole, with areas of low radar reflectivity marked in blue. Ontario Lacus is the large blue spot in lower left. So, we have large smooth patches near the poles. Furthermore, they occur in what look like low points. That’s a pretty good indication that they are lakes, but it’s not foolproof. Now, it would be nice to know what the lakes are made of. Problem is, Titan is covered in this hazy atmosphere which is made of nitrogen and methane. The nitrogen isn’t that bad, but the methane absorbs a lot of light, especially in the near-infrared (the best place to identify molecules). There’s a couple of clear patches, one around 2 microns, and another right around the spectrograph’s long cutoff (5 microns). So, we can use Cassini’s spectrograph (VIMS) to look at the ‘lake’, and examine how the view looks different than the surrounding ‘land’. What scientists were expecting would be more hydrocarbons, but ones that are liquid at Titan temperatures — things like methane (CH4), ethane (C2H6), propane (C3H8), and butane (C4H10). All of those are gases at Earth temperatures and pressures, but Titan is cold enough that ethane and propane are liquids and methane is like water is here on Earth (it can be a gas or liquid, depending on conditions). And all of them would look slightly different from methane. So, what the scientists working on this did was pretty much take the spectrum of the lake and subtract off the spectrum of nearby ‘dry’ terrain, to find the differences, especially in the clear patches. And, to be doubly sure, they did this with different amounts of atmosphere (airmass) in the way — that way, if an effect was caused by the atmosphere, it would change with the amount of atmosphere. They could also look for patterns that would let them extrapolate out to what would they see without the atmosphere. What did they see? Well, they spotted a couple of absorption lines at around 2 microns, and a sharp drop off at 5 microns — exactly what a liquid hydrocarbon should look like. Moreover, the strengths of these features were inversely proportional to the airmass — the less of Titan’s atmosphere confusing things, the clearer the signal got, implying they are surface features, not cloud features. 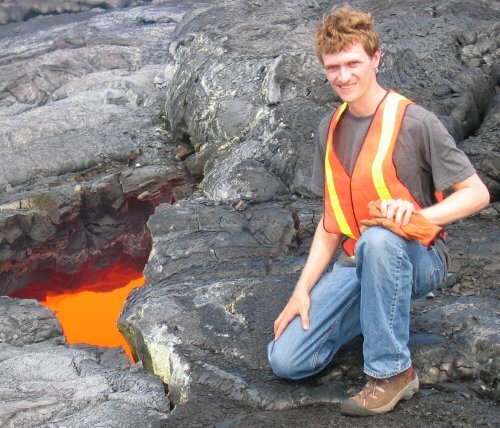 So, there’s pretty good evidence that not only are there flat, smooth things in low-lying areas, but they are contain liquid hydrocarbons. Hence, lakes. Titan is an interesting place. Cassini should be in place to make measurements for at least another 2 year, and there’s talk about extending the mission as far into the Saturnian (and Titanian) spring as we can. We’re hitting equinox right around now (well, next year), but the seasons are 7.5 terrestrial years long. Plus, Titan (and Enceladus) seem to have marked themselves as Interesting to NASA. I might be a ring person myself (a Titan mission would have a poor view of the rings), but I like seeing the outer solar system in general getting attention. Hello, my name is Rebecca Harbison, and I’m a grad student in astronomy at Cornell University, and guest-blogger. Some information about me. I work on Saturn’s rings using VIMS, the Visible-Infrared Mapping Spectrometer. Right now, I’m trying to measure how small the smallest particles are in Saturn’s Main Rings, by looking at how they diffract sunlight. (Think of me as sitting in a theater, staring at the light from the projector and trying to guess at how much dust is in the air by how much I can see in the beam.) In the future, I hope to expand my rings work to model composition and surface properties. I’ve done other stuff over the years as well. My first-year project (which I’m still chugging away at) was a study of the rotation of Hyperion, which is one of Saturn’s moons. It moves in an interesting way — instead of spinning neatly, its odd shape and tides from Saturn make it tumble. Having a model of this not only lets us know what Hyperion is like inside (probably: a mix of rock, ice and empty space, with better packing towards the center), but also helps the people interested in its surface know what they are looking at if they can’t get the high-res pictures. Also, before I came to Cornell, I looked at active galaxies and helped measure how they varied (in hopes of learning about how the black holes inside them worked). I’ll probably be trying to cover some non-Mars things from my corner of the (outer) Solar System. So, for my first post, I’d thought I’d talk about something a little more down-to-earth. Mostly because I had this already written when Ryan asked me. It was based on this article, which ran on CNN last week — for those of you with subscriptions to Science magazine and willing to read through the statistics, the study is here. Expect a Cassini-themed post by Thursday. I’m still getting the hang of this blogging thing. As Ryan will be out doing field work in Hawaii for the next few weeks, and I’ll be in the Windy City at a little concert called Lollapalooza (woohoo! ), we’ve invited a guest author onto the blog. So look for posts from Rebecca Harbison, a fellow Cornell grad student who studies the rings of Saturn with data from Cassini. Welcome to the Martian Chronicles, Rebecca!